Happy Pongal / Makar Sankranti Wishes to all my readers, friends & family. 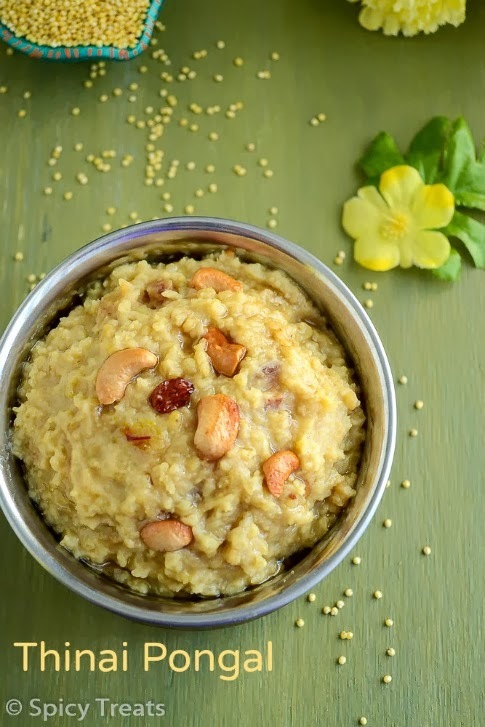 I wanted to share some quick and healthy pongal for the occasion. 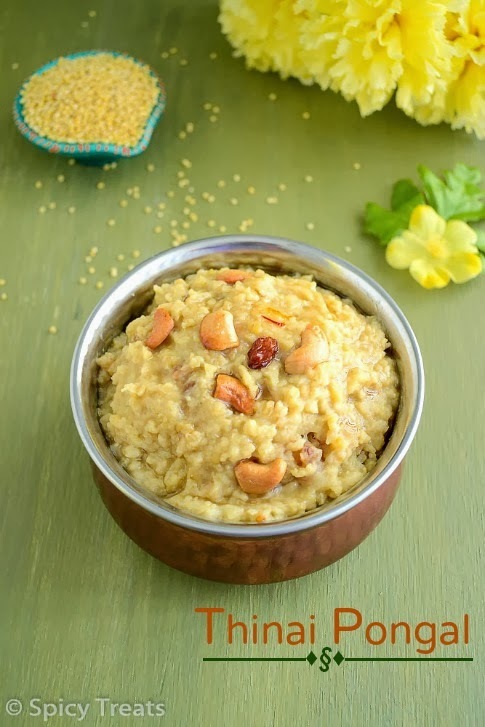 So today tried this Thinai Sakkarai Pongal / Foxtail Millet Pongal. This is a healthy and good alternative for rice and tastes so delicious and filling. 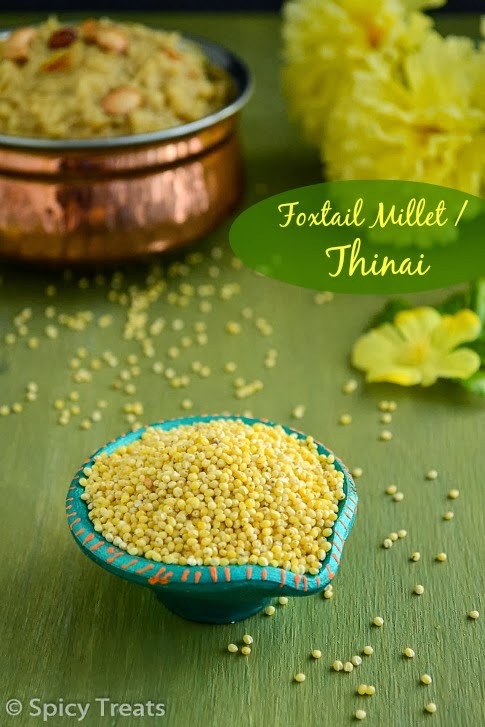 Thinai/Foxtail millet is a very healthy, fiber rich grain that is good for growing kids, adults and aged people. I did exactly like the way i do for Sakkarai Pongal using Pressure cooker except the addition on saffron. I usually do not saffron to my sakarai pongal but this time for extra flavor and colour, i added few strands of saffron to my millet pongal. This is one easy and quick method. Here you go..
First wash and soak millet with enough water and keep aside. Then heat 1/2 tsp ghee in pressure cooker and add moongdal and roast in medium heat till light golden brown and flavor comes. After that to the dal, add drained millet and 2 and 1/2 cups of water, a tiny pinch of salt(optional) and pressure cook for 2 whistles. And then wait till pressure cools down, mean while take powdered jaggery in a sauce pan and add 2 tbsp water and cook in medium heat,stir until jaggery dissolves no need to boil, just melting is enough. once the pressure downs, remove the lid and add the strained jaggery syrup and turn the stove to medium heat. Let it cook in medium heat until the raw smell of jaggery leaves, 3-4 minutes. stir now and then. and stir well and after a minute add milk and saffron strands and stir well. After adding milk do not cook for long time, just 1-2 minutes. Then lastly add cardamom powder and ghee roasted nuts and raisins. That's it...Delicious & Healthy Thinai Sakkarai Pongal ready. I did not roast the raisins in ghee, instead soaked in water when i started my pongal and then drained the water and added it to the pongal. This way raisins remains crunchy and tasty. Add more or less ghee depends on your taste. Adding milk is optional but i like to add milk to my sweet pongal since it gives nice rich taste and flavor to the pongal. The same way instead of thinai you can use quinoa, regular rice, cracked wheat but adjust water level. I measured in 160 ml cup you can use any tumbler,cup or bowl measurement. measure everything using the same cup/tumbler - rice/millet,dal,jaggery,milk. 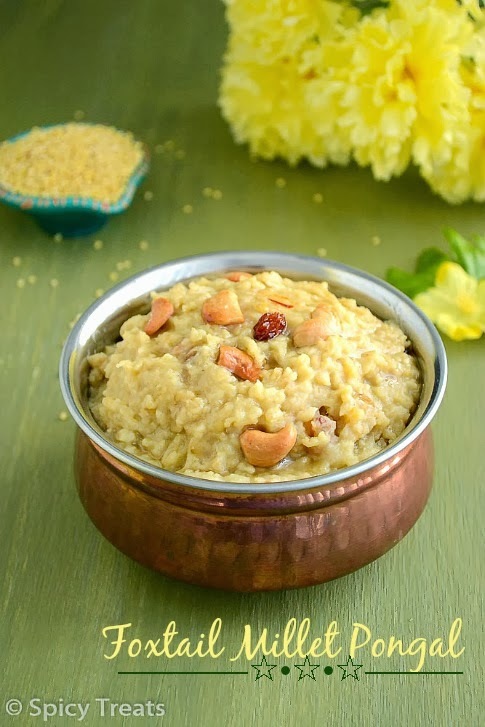 Healthy and yummy Thinai Pongal.. Looks so lovely and festive, Sangee!! Very healthy and delicious pongal. Very healthy thinnai pongal. Very well presented. 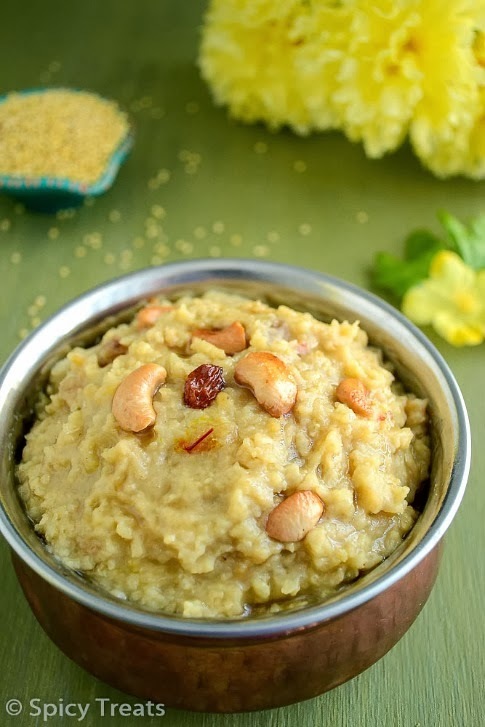 Millet pongal looks fantastic! 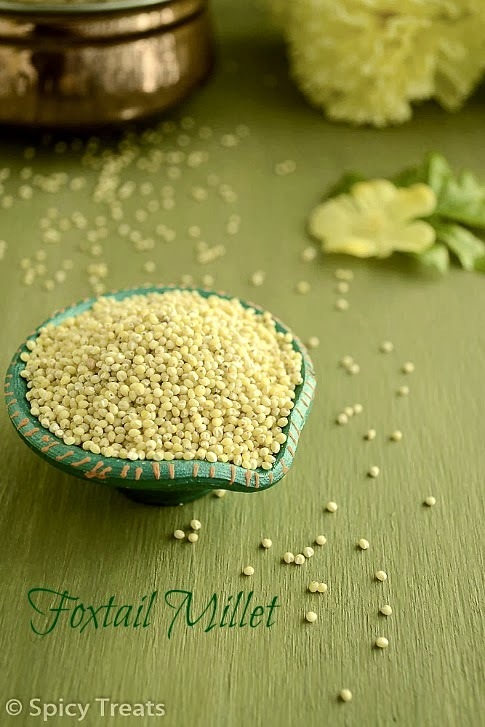 I recently started using millet and fall in love with this little grain/seed! Love your step by step instruction and gorgeous pictures!